Last Friday, I was down and out with a stomach bug and found myself lounging in front of the Food Channel. I know. Stomach bug and Food Channel? I don’t get it either. Anyway, my favorite tele-chef, Ina Garten, came on to teach me how to make a delish sandwich with salmon, bacon, guac, and arugula on ciabatta bread. 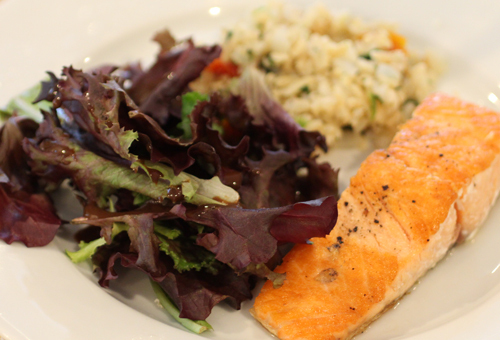 What was really cool about the recipe (beyond the fact that some of my favorite foods in the world were smushed between two pieces of toasty grilled bread) was the super fast way she cooked the salmon. 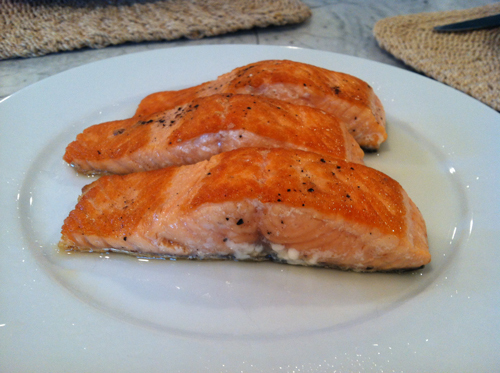 I usually drown it in some marinade that takes away all the yummy salmon flavor and then bake it for 30-40 minutes. I know. I’m clearly doing something wrong. 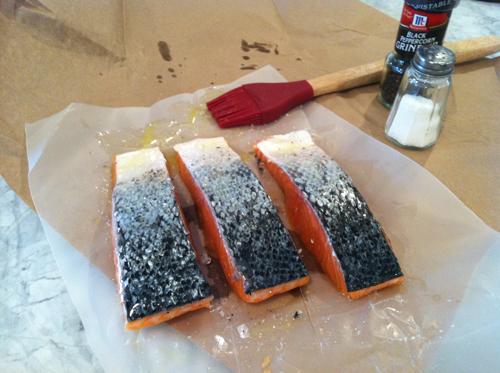 Take 2-4 salmon fillets, brush ’em with olive oil on both sides, then salt and pepper them on both sides. 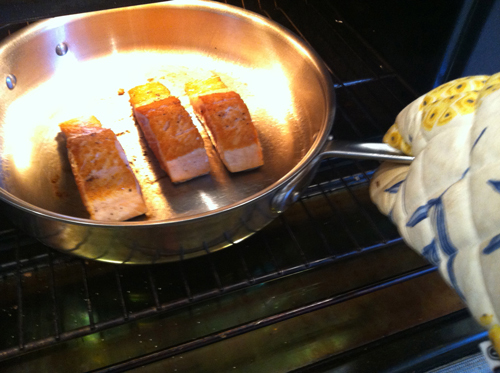 Place ’em, skin-side up, in a pan (she used a dry cast iron, I used a dry All-Clad) that has been sitting on medium heat. Cook ’em for two minutes exactly. Cook ’em for two minutes exactly again. 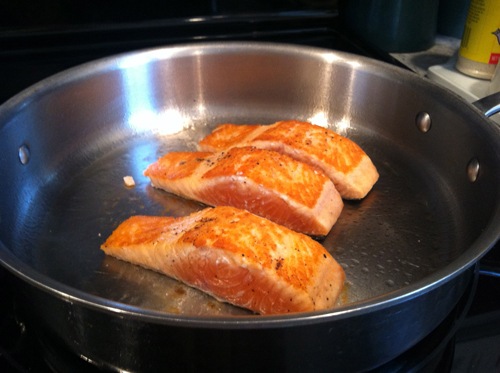 Transfer the pan to a preheated 400 degree oven. Cook ’em for two minutes one last time. While my six-minute salmon was cooking tonight, I microwaved a bagged grain and veggie combo (4 minutes 30 seconds), and made a simple salad of baby greens and balsamic dressing (45 seconds). I, along with my eight-year-old, scarfed it down in six minutes flat. I’m still working on my six-year-old.